This very handsome and dignified, 14-story structure is one of the most elegant and exclusive buildings on the avenue because of its very fine detailing and the fact that it has only 12 apartments. Exquisitely designed in Italian-Renaissance-palazzo-style with rope quoins and a balustraded roofline by J. E. R. Carpenter, this limestone-clad building has a side-street entrance and attractive landscaping. It was built in 1925 and converted to a condominium in 1981. To the south it adjoins 985 Fifth Avenue (see The City Review article), which is setback in a plaza, and it is directly across 80th Street from 990 Fifth Avenue (see The City Review article), a very handsome Italian-Renaissance-palazzo-style apartment building that was built in 1927 and designed by Rosario Candela, Carpenters successor as the preeminent designer of luxury apartments of the pre-war era on the Upper East Side. The building has a quite bold and interesting bandcourse on the fifth floor, shown above. The building, which has nice detailing shown above and below and permits protruding air-conditioners, occupies the former sites of townhouses built for Nicholas F. Brady and Hugh A. Murray. Each apartment has 11 rooms. 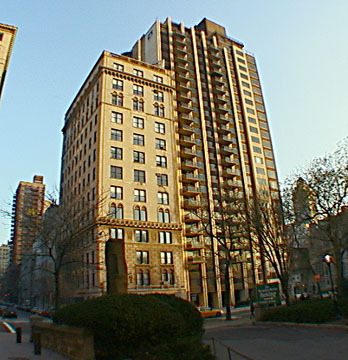 "In 1926, the $11,000-per-year penthouse apartment was rented by Sylvia Green Wilks, shortly after the death of her husband Matthew Astor Wilks," wrote Andrew Alpern in his excellent book, "The New York Apartment Houses of Rosario Candela and James Carpenter" (Acanthus Press, 2001). "In 1940," he continued, "Mrs. Wilks, the daughter of the infamous eccentric Hetty Green, exchanged the penthouse unit for two lower-floor apartments. The one on the third floor served as her home. 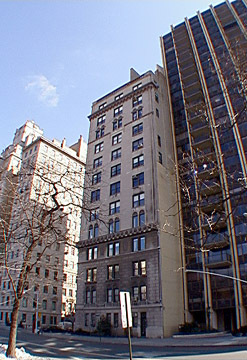 The other on the fourth floor was used to store excess furniture from the house at 440 Madison Avenue she had shared with Matthew Wilks, from other other houses she had owned, and from the mansion of her dead brother, the eccentric Colonel Edward Green. The reclusive and equally eccentric Sylvia Green Wilks died in 1951, leaving an estate of $90 million after taxes, which was distributed amongst 63 charities." 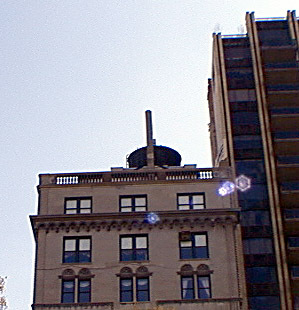 Right in the middle of Fifth Avenues "Museum Mile," 988 Fifth Avenue, which has inconsistent fenestration, no garage and an exposed rooftop watertank enclosure, shown above, fortunately does not have its Central Park vistas largely obscured by the nearby Metropolitan Museum of Art as do several of the nearby luxury apartment buildings to the north. It is also only a block away from cross-town bus service and is convenient to a supermarket on Madison Avenue.